As military police began a 10-day training program with the U.S. military in Phnom Penh on Tuesday, questions are being raised again over Washington’s ongoing support to Cambodian security forces involved in serious human rights abuses. On January 3, military police officers opened fire with AK-47 assault rifles killing five people and wounding at least 42 more after being deployed to break up a demonstration of mostly stone-throwing garment workers on Veng Sreng Street in the city’s Pur Senchey district. 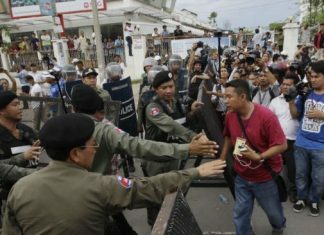 The previous day, members of the elite 911 airborne brigade, armed with steel pipes, wooden batons and sling shots, viciously attacked striking garment factory workers, Buddhist monks, union activists and journalists outside a South Korean-owned garment factory also in Pur Senchey. Under the U.S.’ Leahy Law, no U.S. military assistance shall be afforded to any unit of the security forces of a foreign country if there is credible information that such unit has committed any gross violation of human rights. 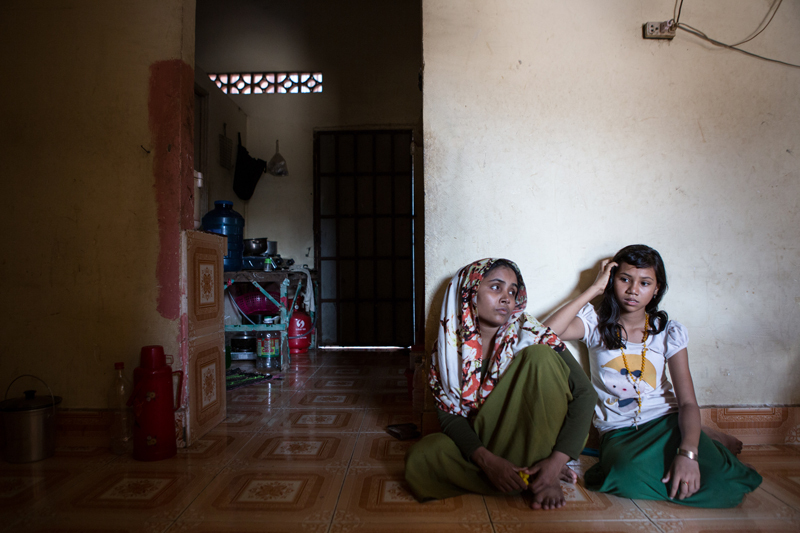 “There is no doubt that the 911 and the gendarmerie committed serious human rights violations when they broke up the garment worker protest,” said Brad Adams, director of the Asia division of Human Rights Watch. “Each used unnecessary, indiscriminate and illegal force,” Mr. Adams said. Scenes from the Veng Sreng Street clashes made news around the world, with numerous images and videos showing military police firing AK-47 assault rifles indiscriminately into crowds of mostly stone-throwing protesters. Similar images show 911 paratroopers chasing down and severely beating unarmed protesters, including monks and photographers. The wounded from Veng Sreng Street include a 17-year-old girl who was shot and injured by military police gunfire while walking home from school. “These forces [military police], who have human rights abuses against their name, should not be supported by the U.S. or anyone else,” said Thun Saray, director of local rights group Adhoc. Under the Leahy Law, an exception clause can be exercised if the U.S. is satisfied that the Cambodian government is taking effective steps to bring individuals responsible for human rights abuses to justice. However, based on the government’s poor record in holding anyone to account for killings by members of the police and military, Mr. Saray said that impunity would likely rule the day regarding the killing on Veng Sreng Street. “There will be no serious investigation into the [Veng Sreng Street] clashes,” Mr. Saray said. “We have seen in the past, such as in the killings of [forestry activist] Chut Wutty and [union leader] Chea Vichea, that nothing will happen. If human rights workers were part of the government’s investigation we could have some trust, otherwise, no confidence,” he said. The U.S. State Department did not reply to emails Wednesday seeking comment on whether there would be a halt in military cooperation and aid to Cambodia. Asked to comment on possible violations of the Leahy Law by the military police and Brigade 911, Sean McIntosh, spokesman for the U.S. Embassy, said that the U.S conducted all military activities in accordance with the law. “I would like to reiterate that our military engagement fully complies with Leahy vetting requirements, including the current humanitarian assistance and disaster relief exercise to which you are referring.” Mr. McIntosh wrote in an email, referring to the current exercise in Phnom Penh. “Our military engagement is a critical component of U.S. efforts to promote respect for human rights within the Cambodian military, in addition to assisting with its professionalization and defense reform efforts,” he added. Royal Cambodian Armed Forces spokesman Lieutenant General Chhum Sucheat said the killings on Veng Sreng Street are being investigated, and that he could not comment further while the investigation is underway. Lt. Gen. Sucheat said the country’s military is trained by several countries to protect national interests. “We have been trained, not only by the U.S. but we have French and other friendly countries. Our training is not only about human rights but about how to protect the elected government and to fight against terrorism and protect the public interest,” he said. “We did not have any intention to kill those people, we just implemented self-defense,” he said. Government officials have largely defended the use of lethal force against the stone-throwers. On Friday, the Council of Ministers’ Press and Quick Reaction Unit said that Prime Minister Hun Sen had discussed establishing a committee under Interior Minister Sar Kheng to study the Veng Sreng Street clashes. “When the authorities use excessive force or illegal force, it is an abuse of people’s rights,” said Sok Sam Oeun, head of the legal aid organization Cambodia Defenders Project. “And if the state does not care to protect [its people] by investigating and sending the abuser to the court, [that] is a human rights abuse,” Mr. Sam Oeun said. To this day, there has been no investigation or arrests reported in the killings of Mao Sok Chan and Eng Sokhom, bystanders slain when police and military police opened fire at protesters during stone-throwing incidents near the Monivong Bridge and in Stung Meanchey. Naly Pilorge, director of local rights group Licadho, accused Washington of blindly supporting Cambodian military units involved in gross violations of rights. “We have provided evidence to U.S. Congress for several years, including last year, of the U.S.’ military-to-military support being used by Cambodian soldiers in the abuse of their own people. And to no avail,” Ms. Pilorge said. “There needs to be an investigation [into the Veng Sreng Street killings] and the government needs to demonstrate the political will to identify and prosecute military and police for the use of excessive deadly force,” she said. The militaries of the U.S. and Cambodia have enjoyed a close relationship since 2006, when cooperation was resumed following its suspension after the factional fighting of 1997, in which forces loyal to then-Second Prime Minister Hun Sen fought tank battles in Phnom Penh to oust First Prime Minister Norodom Ranariddh. Diplomatic cables obtained from WikiLeaks show that the U.S. Embassy in Phnom Penh in 2009 and 2010 vetted and cleared at least 43 members of the 911 Special Airborne Brigade for admission to U.S-sponsored training programs. “Investigations of the incidents [of torture and killings in 1997] did not result in the identification of specific officers or subunits responsible for the human rights abuses. As the UN report on the incidents states, it is difficult to know whether the abuses ‘resulted from orders or were committed by local officials who took the opportunity to settle old disputes’,” the embassy said in a cable dated June 2009.